I’ve always enjoyed pageantry. I confess that the sight of soldiers in uniform, wearing crested helmets and scarlet jackets, sitting on gleaming black horses and being put through their paces by an even smarter officer, gladdens my heart. So, today, I’m visiting the Household Cavalry. 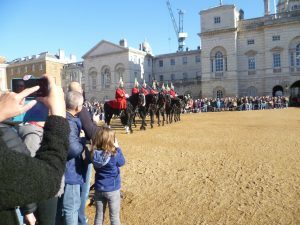 Visitors watch the Changing of the Guard ceremony in Horse Guards Parade. These two cavalry regiments form The Household Cavalry which has several functions; first and foremost, they are soldiers, fighting wherever they are sent; they are currently serving in Afghanistan. Their other important job is to protect the Sovereign; and to undertake various ceremonial duties, such as the State Opening of Parliament, escorting the Sovereign during State visits from foreign heads of state, Royal Weddings and the like. Their equestrian skills are second to none. 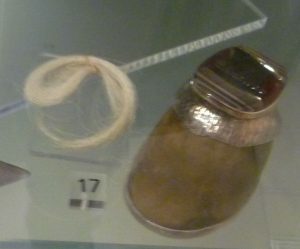 Farrier’s axe and officer’s helmet, early 19th century. The axe was used to kill a badly wounded horse and also to chop the hoof off a dead one which enabled the farrier to get a replacement horse. I’ve always been interested in early 19th century military history, and recently, I visited the Household Cavalry Museum which is full of splendid uniforms, bloodthirsty weapons and anecdotes of astounding courage; many of which centre on the battle of Waterloo, in June 1815. It was a battle in which both the Life Guards and the Blues and Royals were heavily engaged. Their ceremonial dress is magnificent. The scarlet jacket belongs to the Life Guards, and the dark blue belongs to the Blues and Royals. You can see that the basic design has not changed very much over the centuries from the photo below. If Lieut. Lorraine had been lucky enough to have been invited to the Duchess of Richmond’s famous ball on the eve of the battle of Waterloo, then this is what he would have worn. 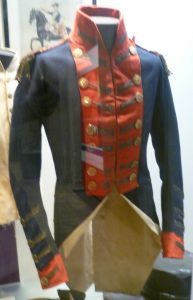 It’s made of blue woollen broadcloth with scarlet collar and lapels, gold lace loops and gilt buttons. But the weather that June was notoriously wet and a soaked blue broadcloth would have weighed him down terribly, so perhaps it’s just as well he wasn’t on the guest list – many of the officers at the ball went straight from the ballroom to the battlefield. 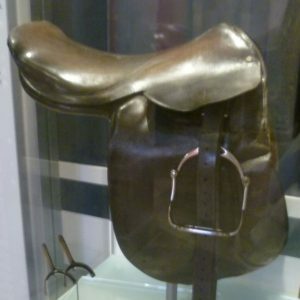 Officers had to provide their own saddles and riding equipment as well as horses. They also had to buy an officer’s commission, starting at the bottom as a subaltern, and top cavalry regiments, like the Life Guards, were very expensive. It wasn’t until after the fiasco of the Crimean War in the 1850s that officers were promoted on merit rather than their ability to buy their way up the career ladder. But you didn’t have to be rich to become notable in your regiment. 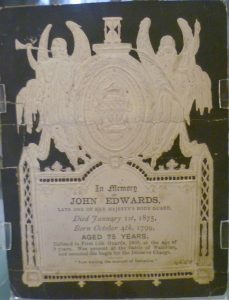 Take John Edwards, 1799-1875. He joined the 1st Life Guards age 9, in 1808, and became a bugler. At Waterloo, he was Field Trumpeter under Major-General Lord Edward Somerset and, aged only 16, it was he who gave the signal for the decisive charge of the 1st Life Guards. 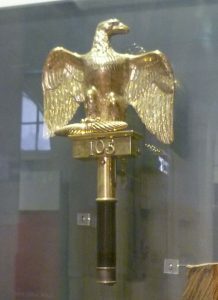 The capture of one of Napoleon’s eagles at Waterloo was cause for great celebration. Napoleon had designed them himself – in emulation of Ancient Rome – and presented them personally to his regiments, so losing one was seen as a disgrace. 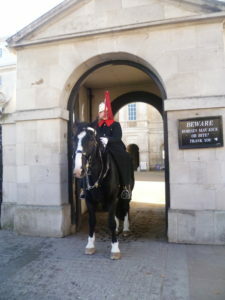 One of the most flamboyant characters in the 2nd Life Guards was Corporal John Shaw (1789-1815) who was famous for his size – he was over six foot – and strength; he once carried two ponies down stairs, one under each arm (or so the story goes). He took the King’s shilling, that is, he enlisted as a private in 1807 and soon caught the attention his officers by his strength and skill in various regimental exercises. He became a renowned boxer and defeated Edward Painter, one of Boxing’s champions in 28 minutes. On the morning of June 18th, 1815, he took part in the first charge of the battle. A French cuirassier charged straight at him and Shaw parried the thrust with his sword and finished off the cuirassier by slicing straight through his helmet and skull right down to the chin. He fought ferociously in several other charges but eventually found himself outflanked and surrounded. He killed nine Frenchmen with his sword before it broke, then he tore his helmet off and began to use it as a sort of knuckleduster. He was eventually killed by a cuirassier sitting a little way off who, unsportingly, one feels, shot him with his carbine. Henry William Paget, Earl of Uxbridge (1768-1854) was a soldier who had fought with great distinction both in Europe and in the Peninsular. He was also a man with a scandalous private life – he had eloped with the Duke of Wellington’s sister-in-law. The Earl’s knee was shattered by one of the last cannon shots at Waterloo. He was near Wellington when it happened and exclaimed, ‘By God, sir, I’ve lost my leg!’ To which the Duke replied, coolly, ‘’By God, sir, so you have!’ His unemotional response was possibly caused by his resentment at Uxbridge’s behaviour – though Wellington’s own reputation with regard to the ladies was hardly spotless. The Earl’s leg had to be amputated above the knee and he had a cork leg made. Dissatisfied with it, he eventually had a fully-articulated prosthetic leg invented for him which creaked loudly whenever it bent. However, it was successful enough to become the standard prosthetic leg until 1914. I’m ending with a couple of mementos from the battlefield. The curl of horse hair comes from Napoleon’s horse, Marengo; and the hoof snuff box comes from one of the horses killed in the battle. It’s gruesome, yes, but remember that peace, however welcome after twenty-five years of war, left a lot of people, including soldiers, unemployed. We know that there were a lot of scavengers in the years following who made a living selling whatever they could find on the battlefield, from teeth to gilt buttons and bits of armour. The mounted guard looks both right and left to check for anything untoward. 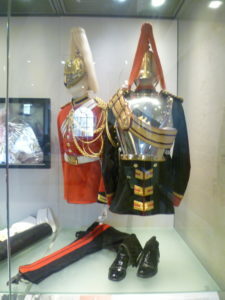 The Household Cavalry Museum at the Royal Horse Guards in Whitehall is well worth a visit and I recommend it. You can even have your photo taken standing next to one of the guards. The guard will be in position for an hour before being relieved. The horse has been trained to stand still. Great post, Elizabeth. I haven’t been to that museum, but it’s going on my list of places to visit. Thank you, Gail. Their shop had some rather mice ‘poppy’ jewellery and a very attractive long merino wool scarf, navy blue on one side with a red poppy on two corners and scarlet on the other side with navy blue poppies.And I liked their pencils with interesting gold finials. Love the Household Cavalry. Seeing them ride is always a treat. They were decimated by an Irish bomb, as I’m sure you remember. I think that was the Blues. But like you, I’m a sucker for this kind of pageantry. Museum sounds great. An IRA bomb is what I should have said, not Irish! I know. Slips of the fingers are easily made. Thank you for your comment, Elizabeth. 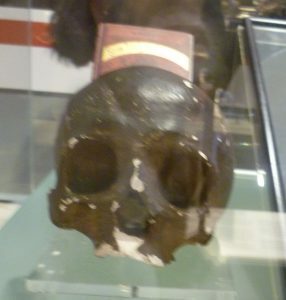 There is a Museum case devoted to the I.R.A. bomb in Hyde Park containing some poignant and tragic mementos of that awful day.